After a string of classic masterpieces, Kurosawa confronted his influences head-on. Throwing John Ford's Western aesthetics into a blender and painting them pitch black. The results are Yojimbo and its legacy. Yojimbo ("the bodyguard") is the tale of a flea-ridden wandering swordsman, Sanjuro (Toshiro Mifune, in his finest performance). He arrives at a gang-war ravaged town and starts hiring himself out to both sides, playing them off against another, in order to wipe all the scum out. Sound familiar? 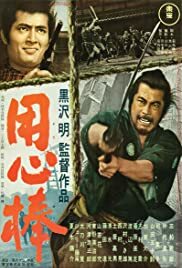 Even though Yojimbo the film is a thrilling ride and very funny dark comedy, it is hard to imagine what a bombshell this was for audiences at the time of its release. It is as far removed as can be from the then squeaky-clean aesthetic of samurai films: you can almost smell the sweat and the grime of the sordid town and characters. The action is fast and furious, enhanced by Kurosawa's deft use of telephoto lenses and Masaru Sato's avant-garde score. With all that, Yojimbo was a massive kick in the pants of a fossilized genre. It exploded beyond the confines of its own country and genre, forever influencing the very Westerns that had inspired it, particularly a new wave out of Spain and Italy at the time. One Sergio Leone copy/pasted the whole plot into his own revisionist Western and gave us the Dollars trilogy. The slightest of Spaghetti Western enthusiasts owes Kurosawa a debt of gratitude. As with all truly great work, its greatness exists even devoid of context, and for all the historical precedents it set, all Kurosawa wanted to make was an entertaining film. That he bloody well succeeded is the least you can say about Yojimbo.